My name is Ken Maudsley. I live in Atlanta, Georgia. As this story began, I was a healthy 41 year old male. On August 11, 2011 I had a general seizure. I was out for 20 minutes or so. Paramedics revived me and took me to Emory for treatment. CT scan revealed a lesion. A follow-up MRI indicated a brain tumor was the cause of the seizure. 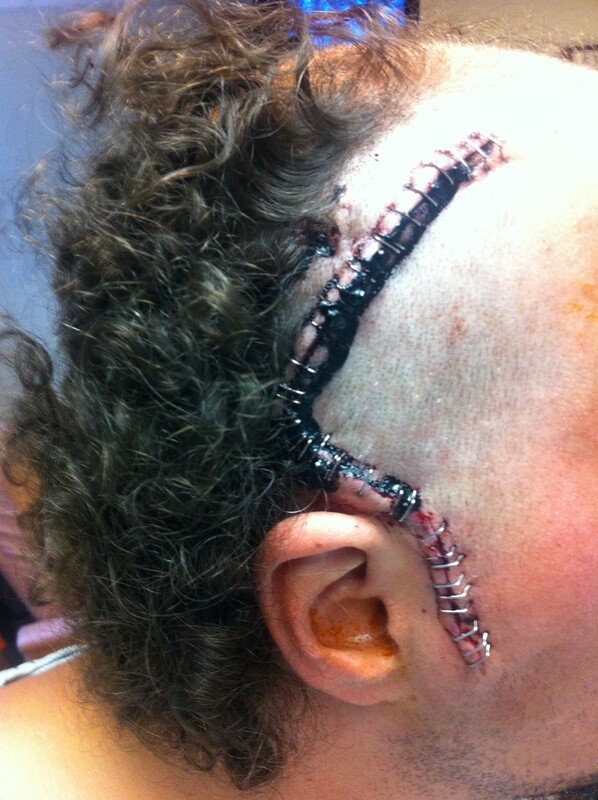 On August 15 a craniotomy was performed. The tumor was removed. Pathology confirmed that the tumor was a glioblastoma multiforme stage IV. My wife, Tina, has been amazing. Researching, fighting for my best interests, handling everything, and still working. I don’t know how she does it, but I’m grateful and lucky. My mother, Cheryle, came to be by my side immediately and it has been wonderful having her to help take care of me. She would be here every moment if she could. Thanks, mom! I have had an incredible amount of people (coworkers, neighbors, family, friends near and far) offering all kinds of support (food, rides, research, contacts, prayers, everything). Thank you, everyone. But I especially want to thank this group shown below — my wife, Tina, sister, Sharon and brother-in-law, Albert. They have really bent over backwards to help me make informed decisions and maintain a smile. 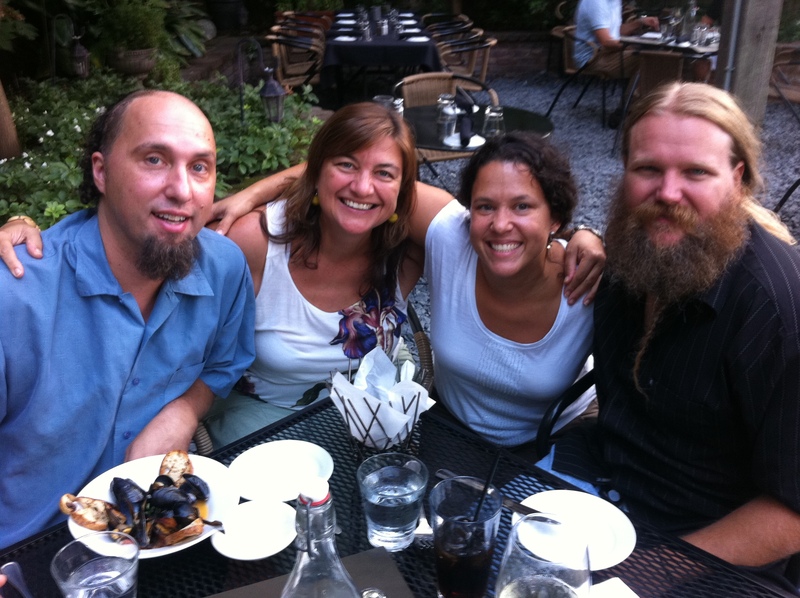 Tina’s parents, Ken and Liisa, arrived on September 14th to lend their support and help. It is great having them here. Having extra help really takes some burdens off our shoulders and allows us to concentrate energy on healing and getting organized. There is no shortage of friend and neighbors asking what they can do to help, wanting to come visit and expressing their feelings and hopefulness. I just caught up…guess the horrid cake will stay here with us since you really don’t need to be eating chocolate/sugar…What a save for you!!! : ) Well, the thought was there. David is so looking forward to seeing you tomorrow. Hugs to you and Tina. You have a hell of an army sitting by you! Ready for battle and celebrations! Hello Ken. Found your blog searching for new information on unmethylated GBM cases. Ironically, my husband is also named Ken, and he was diagnosed in July with the same tumor as you: a right, temporal GBM that we just found out is unmethylated. He is also on the young side for this tumor, at 45. I will follow your journey as we travel ours. Like you, my husband feels good, despite fatigue. I’m surprised you got into a trial without a recurrence. Your attitude is beautiful. I wish you and your wife the very best. This is, indeed, the single most difficult thing we have ever faced. I just wanna say hi and my Heart goes out to you. My Fiance has Stage 2/3 Astrocytoma. Diagnosed October 2015. Surgery Jan & Feb. He just finished Radiation last Monday and will start chemo on Friday as there is 1cm residual tumour left.